Artists Assemble: Trash Skateboard | Deanne J. In art at the moment, we are able to construct a 3D piece of artwork. There were a few groups that we were able to join. These groups consist of wire, clay, plaster a few other and trash, the group that I chose to be in. Within the trash group we were able to search up what was interesting in our perspective and would have to create a plan for our actions. When searching up we came to a conclusion to create a 3D skateboard out of the following materials; wood, cans (for decoration), hot glue to attach the two together. Our project has come far at this point. We were able to complete one skateboard for one of our group members and are in the process of the second skateboard. There were a few difficult parts of this project which are surprisingly the collecting of the cans as there were three skateboards that would need to be produced and each skateboard would need about 50. Also the cutting of the cans were the most difficult as there were many cans to cut and the process was slow and needed to be handled carefully. Lastly the thought of the wheels and trying to figure out how to attach the wheels with giving them the ability to spin. I believe that I am satisfied with my teams work and that after the project we will be proud of our achievement. I look forward to testing the skateboard out afterwards. The reason for making my skateboard completely silver was because we were unable to find cans all of the same color/type so I made the decision to use the under side of the cans instead of having random colors around the place. As you can tell the board is quiet plain. On the under of the board I will paint it completely blue and add some clouds to it. I wanted to make the bottom side the sky and the clouds because it symbolizes freedom, which I believe is key in life. I decided to not add the wheels as it is difficult and I will be unable to stand on it anyways. On the top side of the skateboard where the cans are I think I will get people from my school to sign it as a memory of them when I leave and because I think it would be cool to have everyone's name on it. I really liked this project am excited to complete it. Deanne this is really cool I like how you recycled materials in order to make it. Hi Deanne, I love this idea! It's really creative and innovative, it is amazing how many cans you were able to collect. If you are not adding wheels because you plan to stand on it, what is it's purpose? Is it for decoration? Yes, of course, anytime. What are you working on at the moment? I really like this skate board sculpture. It is really neat and detailed, and i can see you put a lot of work into it! Thank you, what are you working on at the moment? Maybe we can share ideas and suggestions. 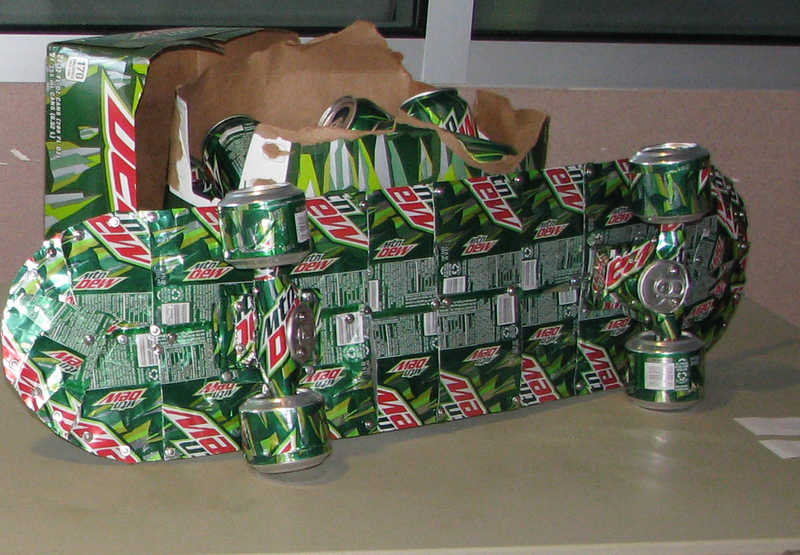 amazing work Deanne, That is one of the most creative uses of empty cans i have ever seen.